Exclusive to Advanced Interior Designs! 2 Color Options! A simple profile, clean lines and meticulous attention to detail have elevated the Brunston Tubular chair to an icon of twentieth century furniture design. 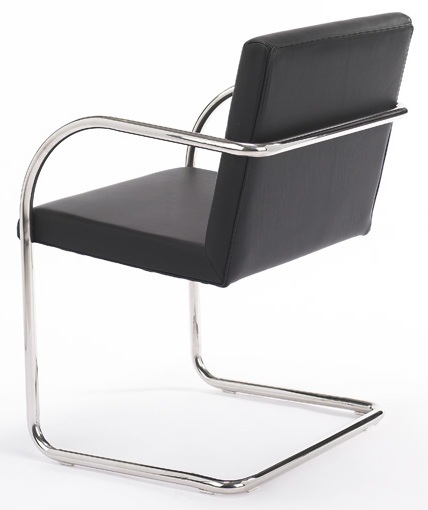 The chair was created by architect Ludwig Mies van der Rohe and famous designer. itËs a particularly straightforward style however its charm lies within the straightforward details. Our high quality version has a tubular polished chrome steel frame and completely upholstered with Italian top grain leather. A truly comfortable chair that is suitable for home and office. -- Please Choose an Option --	22"W x 23"D x 32"H: Seat H - 18": Arm H - 26"